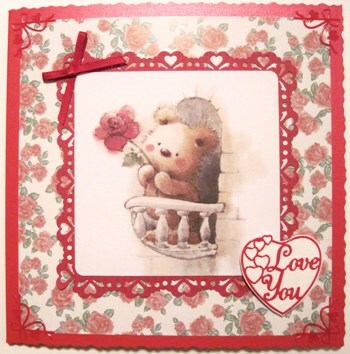 Red deckle edge 144mm sq handmade card has picture of cute bear holding a red rose on a balcony, mounted on red paper with cut-out heart border, matted onto a faded red rose background. 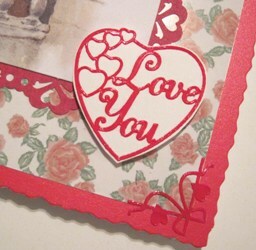 The corners are defined with red heart and bow details, and there is a 'Love You' outline raised motif. This card is blank inside but please use the Personalise form if you would like a printed insert. 10% of the purchase price of this card goes to Dogs for the Disabled charity.